We are not sending out Race Packs in advance. All participants will receive their timing chips and Race numbers at the onsite Registrations. The timing chip numbers and Race numbers will match. 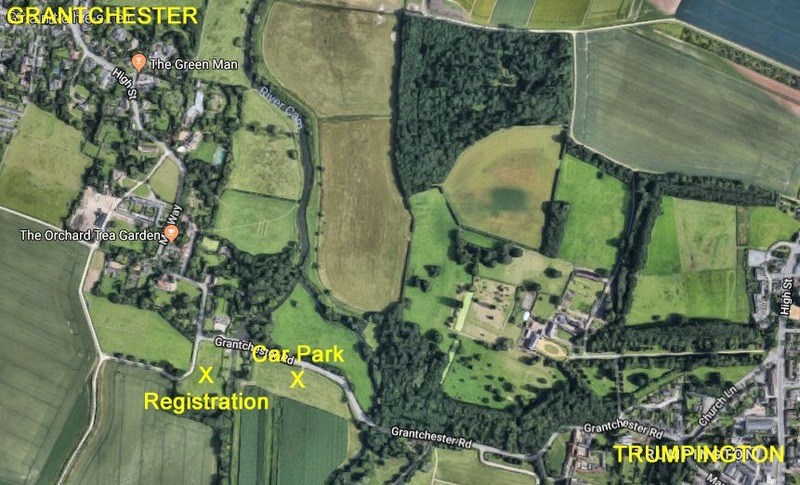 The Runs and Parking are located on the Trumpington side of Grantchester. Coming from Grantchester, after you pass The Orchard Tea Garden, watch out for the flags (thanks to sponsor Great Events). The Grantchester Village Car Park will be ~100m further on your right. Coming from Trumpington, pass the Trumpington Church and watch out for the Car Park signs on your left. There is plenty of space for bikes around the Registration area. We have over 10 teams entered. Congratulations to ‘Rowers wot run’ who have won the vastly sought-after inaugural ‘GCR Best Team Name Award’. Please watch out for them on Bourn Brook. All the best for a successful and enjoyable run. We appreciate your support for the Grantchester Charity Runs and our two charities, Addenbrooke’s Charitable Trust and Maggie’s Centre Cambridge. It wouldn’t be nearly so much fun for our Organisers, Marshals and Helpers (all volunteers, I should add) without you!! Give the Marshals a wave as you go past. I’m at the 2 & 3km markers (so you will pass me twice). Smile as I’ll have my camera with me!